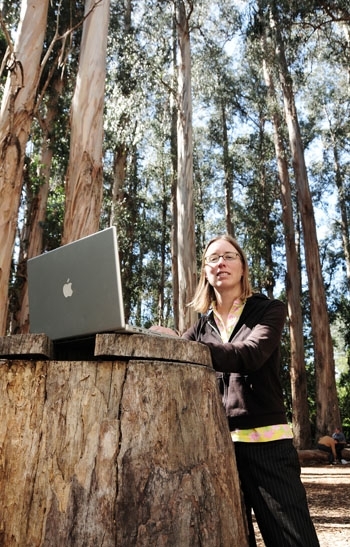 Jennifer English, here pictured on the UC Berkeley campus, has explored the city of Berkeley and Bay Area hiking trails and has written about her experiences on her blog. Jennifer English, a blogger from Berkeley, introduces the concept of her blog where she discovers the city of Berkeley on foot. Walking every street in Berkeley does not seem to be enough of a challenge for Berkeley resident Jennifer English, who documented her journeys through an online blog and is currently writing a new blog describing hikes accessible to those without cars. "I moved here five and a half years ago from elsewhere in the Bay Area, but I was very unfamiliar with the East Bay and Berkeley, and I wanted to find a way to get to know Berkeley better," English said. "And I started walking around a little bit in my neighborhood and realized it's a much more interesting place than a lot of other places that I've walked." After looking at a map of Berkeley, English, 41, began walking every street starting in mid-2006 and began a blog documenting her findings a few months later. "People just go about the things they do every day, and you go to the same spots, and you never see the rest of the place that you live," she said. Walking through Berkeley, English found interesting differences between certain areas, specifically between the Berkeley hills and the rest of the city. "Like I consider the flat areas of Berkeley to be very urban and the hills to be quiet and suburban," she said. "Just from going from one to the other it's quite a contrast." reflect the current economic downturn. "A lot of businesses have closed, so a lot of times I'll go back to a commercial district and it'll be a lot different from month to month in terms of what stores are open and closed," she said. "And there have just been a lot of people that are putting gardens in their front yard and they're taking out their lawns." Additionally, English found that there are many natural locations in the city that are worth exploring. "One of my favorite parks that I've found was John Hinkel Park up in the Thousand Oaks area, and it's just, it's like you're in nature and there are all these streams flowing through there, and it's kind of cool and quiet, and I never ever would have gone up there and found it if I hadn't been walking," she said. Stemming from her nature walks throughout Berkeley, English has begun another blog detailing hikes throughout the entire Bay Area that are easily accessible by public transit. "A lot of the adventures that I'm doing, some of them will start right at a park and others I'm trying to find creative ways to get from a transit stop that may be farther away from the trail and, you know, walk through, say, an interesting neighborhood or along some stairways or pathways, or just something to make it an interesting and creative outing," she said. English said exploring the outdoors is even more important because her current job doing website research keeps her indoors all day. "It's a big contrast, I really think I'm even more motivated to get outside because for the last ten years, I've worked all day in front of a computer," she said. "To me, it's been extremely useful in terms of just health and well-being really, and I just want other people to see that they too could get out and take a break on the weekends." English hopes to add a new post once a week describing a new hike and already has several hikes planned that start in Berkeley.